Register Log In AmbergrisCaye.com Home Forums News GOB Vs. Ashcroft Alliance, Again! You might think the BTL litigation saga between the Barrow Government and the Ashcroft Alliance is over, but when it comes to the Alliance, there’s always more to litigate! The latest fight is over 2 registries that the Government nationalized on June 11, 2013. You’ll know them as the International Merchant Marine Registry of Belize (IMMARBE) and the International Business Companies (IBC) Registry. Up until June 2013, they were managed by the Belize International Services Limited (BISL), which is an Ashcroft-related company. IMMARBE, as viewers will remember, sells Belize’s flag as a flag of convenience on international vessels. Back in 2013, Belize was facing serious sanctions from the European Union since some buyers of the flag were engaging in illegal, unregulated, unreported fishing activities on high seas abroad. The situation got so serious that Belize was blacklisted by the EU, and our fisheries products faced trade sanctions because of these illegal vessels. The other Registry, IBC, registers “off-shore companies”, which are given tax-free status and confidentiality to carry out their corporate affairs unhindered. The Barrow Government’s takeover of these 2 registries was on the premise that on June 11, 2013, the Government’s contract with BISL should have ended. In 2005, however, the Musa Government extended it to 2020, in an arrangement that the Barrow Administration have condemned as “secret, illegal and unlawful”. That nationalization started yet another fight with the Alliance. They sued the Government and lost in 2015, when Justice Michelle Arana ruled that the acquisition was lawful and valid. BISL’s attorney, Eamon Courtenay, appealed, and on Monday and today, the panel of judges at the Court of Appeal heard their case. 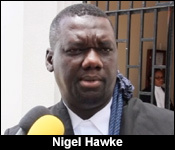 Responding on behalf of the Government was Solicitor General Nigel Hawke, who finished up his defense today. "The claim is for damages for breach of contract because there were 7 years that was remaining on the contract when the government took it over. We have claimed that the government unlawfully terminated the contract whilst the other side is saying it was done lawfully. The basic point is this that the contract provided that the monies that were collected by the registries were paid into two escrow accounts and then certain deductions were made from them, the balance was split between the company and the government, the money was paid over to the government. The argument of the government and which Madam Justice Arana accepted was that in fact the money should have been paid into the consolidated revenue fund and not to the registries. We have said to the court that for reasons which we don't need to go into that what was done under the contract was lawful but we put an alternative which is if that arrangement of the money going first to these escrow accounts and then to the consolidated revenue fund is unlawful, those terms could have been severed, the government could have come to the company and said listen we don't think that this complies with the law, let's amend the contract to bring it into compliance with the law. Instead the government just used its force and might to take away the rest of the contract. So our argument to the court was that the contract can be severed if the court accepts the position of the government and then we would be entitled to collect damages for the client." "Are you able to disclose what quantum of damages would be? At least in the tune of what amount?" "It was a significant amount, in the tens of millions yes." "Do you feel confident in the submissions you've made and they would be enough to sway the judges?" Even though Courtenay would not reveal the quantum of damages that BISL is claiming, back when the Barrow Government won the first judgment in 2015, it sent out a press release welcoming the decision not to award BISL 90 million dollars in compensation. We have not been able to confirm if that is still the same amount they want awarded in this appeal case. Our archives show, however, that 1 day after the Government takeover in June 2013, BISL asserted that the Government had exposed itself to a 60 million US-dollar claim for damages. "Our position fundamentally is that there they have accepted that they have been compliance with section 1:14 and section 4:2 of the finance and audit reform act because the constitution requires certain issues in relation to public monies being deposited into the consolidated revenue fund. We think the agreement does not offend those provisions." "Sir so in this particular instance where you were trying to make the point that this agreement should have gone to parliament. What was the point you were trying to make there?" "The point we were trying to make there, in the body of the agreement there is some aspects of collection of taxes and we're saying once it has to do with the collection of taxes, it should have some parliamentary sanction. Remember this just an agreement between the government and the other party." 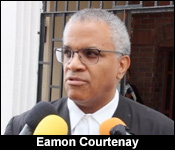 "Just a while ago Mr. Courtenay told us that the government could have taken the action to amend the contract so that the proper distribution of public monies could have gone to the consolidated revenue fund but instead the government used its might and force to just take the company. Would you hazard against that the reason the government did that was that this is an Ashcroft outfit and they were trying to distance itself from that particular entity?" The Court of Appeal has reserved judgment to be announced at a later date.